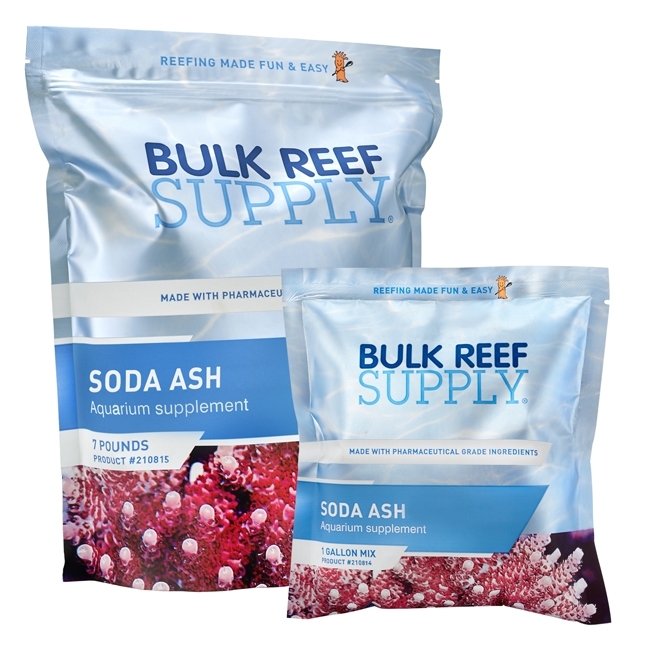 If you need to raise your aquariums alkalinity level or just want a high-quality additive for daily 2-part dosing, BRS Pharma Soda Ash is a great alkalinity solution for any reef tank. BRS 2-Part Pharma additives need to be dissolved in RODI water before being dosed to any saltwater aquarium, which only takes a couple minutes. We offer Pharma Soda Ash in bulk 7-pound bags and also pre-portioned packages that make measuring and mixing even easier. For daily 2-part dosing or even special one-time doses, making a 1-gallon solution only takes a few minutes and can be used once the solution is clear. Using a clean 1-gallon jug or container, fill it 4/5 full of RO/DI water. Add 2 1/3 household measuring cups of BRS Pharma Soda Ash or a single Pre-Portioned package to the 1 gallon jug. Screw on the cap to the jug and shake it for about 10 seconds to start the dissolving process. Remove the cap and fill the container the rest of the way with RO/DI water. Replace the cap and give the container a few more shakes and let it sit until the salts are fully dissolved which should only take a couple hours. Dosing any 2-part solution requires a little bit of math to make sure that you do not overdose your aquarium, however the math is made pretty simply with the BRS Reef Calculator. When adding any alkalinity solution it is very important to dose it very slowly into a high flow area of the tank and monitor your aquariums pH level. Create a 1-gallon solution by following the Mixing Instructions above and then test your aquariums current alkalinity level with your favorite test kit. Using the BRS Reef Calculator Choose alkalinity for the element, Liquid Soda Ash for the product, and the type of New Pharma Pouch. Input your total system water volume, which includes your display and sump, minus any displacement from your rock or other equipment and then click on Calculate. If you are not sure using your display tanks total water volume is a safe bet. The result will be how much of the BRS 1-gallon Liquid Soda Ash solution that should be required to increase your aquariums alkalinity level. Start by following the General Adjustments instructions above to adjust your aquariums alkalinity, along with calcium and magnesium to your desired levels for your dosing regime starting point. Wait 5 days and retest your aquariums alkalinity level and compare the results to your starting point levels to find the difference. The difference between the starting point and the final reading is how much alkalinity will need to be replaced over the course of a 5-day span of time. We recommend testing at the same time of day as alkalinity levels can fluctuate throughout the day. Go to the BRS Reef Calculator and input your new desired level and your new current level along with your total system water volume. Input your values into the BRS Reef Calculator making sure to use the BRS Liquid Soda Ash (New Pharma Pouch). The amount calculated will be the total amount of solution needed for a 5-day span of time. To know your daily dose just divide that number by 5 (see example below). Replenish your alkalinity by adding the 5-day total to your aquarium and any other diminished levels back to your desired starting point, then wait a few hours before starting your daily dosing regime. Monitor and adjust daily dose as necessary. If your alkalinity levels are slowly rising, we suggest subtracting 10% per day until it is stable. If your alkalinity levels are dropping slowly we suggest raising your daily dose by 10% per day. If you are having issues raising your alkalinity, check to ensure your aquarium magnesium level is between 1200-1350ppm and that the solution is added to a high flow area of the tank. Due to the high pH of Soda Ash, additions should be made slowly into a high flow area of the aquarium to help prevent precipitation. If a large amount of alkalinity is needed, we suggest raising your aquarium no more than 1.4 DKH per day. Monitor your aquariums pH when making additions to ensure the pH does not rise over 0.2pH. It is much safer to dose less and test again, than to overdose. Dosing alkalinity at night can help keep your pH from dropping.